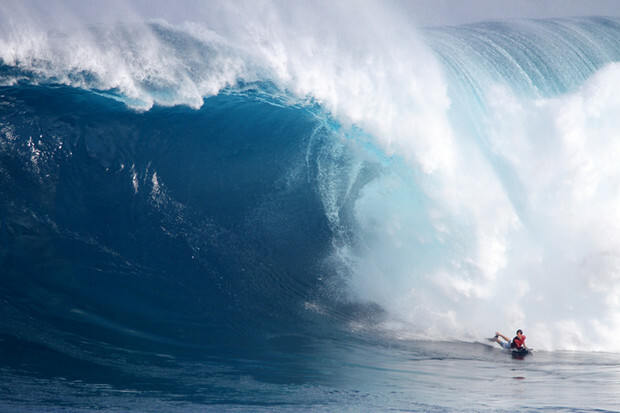 Did Aaron Gold Paddle into the Biggest Wave Ever at Jaws? Recent El Niño swell has been producing monster waves all over the Pacific, but the swell allowed for particular record setting when it reached Maui at excess of 50 ft, according to Surfer Today. "[It was] Definitely one of longest drops I feel like I've ever had. It just kept going. I was like, 'ok, I'm coming down,' and where I thought it would end, it had a whole other section to it," explained Aaron Gold to Surfer Today. Another record was also set when Magno Passos rode one of the biggest waves ever recorded in the history of bodyboarding, at 45ft. Magno Passos lost his left fin riding this wave. Lynton Productions/Surfer Today photo. On his Instagram Passos said, "I lost my fins when I was half way down the wave and I almost lost control of my board. For me it was a miracle not having the lip hitting my legs or my back, it could've broken me in half." Sheesh, it seems like everyone is going for it at Jaws this January, anybody for taking Jaws on a pool noodle?